Featuring specially designed and engineered arbors, our slitters produce the best slit edge quality in the industry. 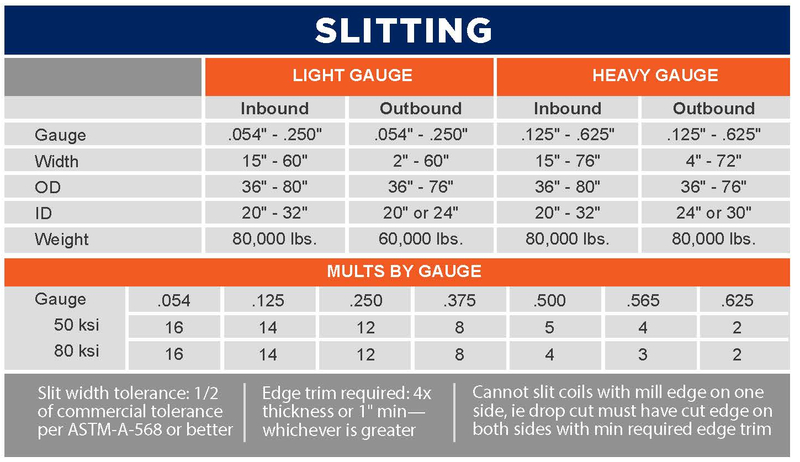 Our heavy gauge slitter — the largest in the South — can handle incoming widths from 15”-76” and make two cuts in .625″ material, fourteen cuts in .125″. Our light gauge Herr Voss/Stamco slitter can make quick work of material from .054”-.250”. The line is capable of providing either 20” or 24” outbound IDs, and has a complete packaging line.